Office Dress or Comfort Duty. Slip tested to CSA Z195-09 / ISO 13287 by Precision Testing Laboratories on March 15, 2015. Do you have the David 507139 in size 11-3E. How can purchase in Elyria, Ohio, United State? 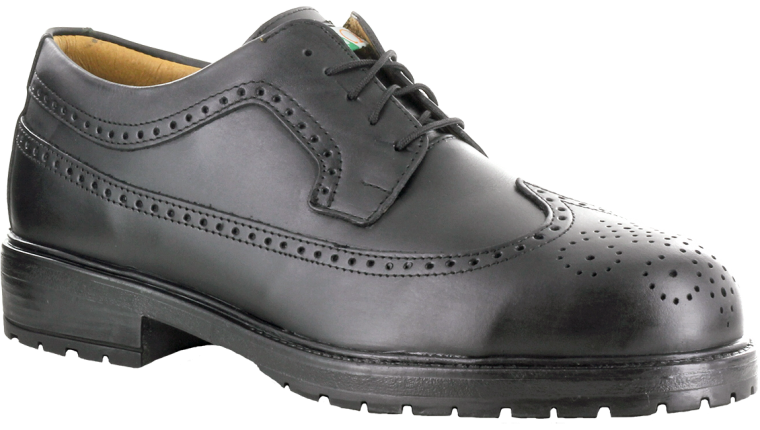 Thanks for your interest in our David brogue safety shoe. Unfortunately this shoe is not available in the U.S. at this time. I will certainly consider adding to our U.S. warehouse in 2015. Sorry to be the bearer of bad news. Can I buy from a distributor in Canada? The Mellow Walk has been the best shoe for me these last few years. Is the David 507139 going to be available in Brown? Plans are in the works for the 507139 in brown but unfortunately I don’t have a release date yet. It may be towards the end of this year. Just wondering if the ‘David’ is available in brown now? And would that be an online specific thing? or if I would be able go into a Marks workwear house or Redwing shoe store and try them on in brown? Hi at present I believe it is still only available in black leather from our retailers. What size are you? If I do see an order in brown leather scheduled in the near future I would be happy to add a pair for you. Thanks. I was originally looking for a 13EEE or 14EE (about a year ago) but wasn’t able to find either, so I settled for the 13EE. Given that the shoe was too tight, the right side split away from the base of the shoe and now here I am looking for another pair. This time I would really like to get a proper fitting David (brogue) but I don’t see the size I need. It appears as though you only offer up to a 13EE, is that correct? Do you have a larger size in the David or do you know of another manufacturer that does? I’m a suit and tie guy in an industrial work environment so the brogue style is the only one that suits the application for me. Unfortunately 13EE is the largest size on our brogue. We do offer our Quentin models in size 14 though you may not find this style dressy enough for you. I would recommend either our Quentin 550049 or 570049 models. Thanks for writing. Seeking the “David” brogue in US size 14 (I’m in Richmond, BC) – are they available? Do you make/distribute any safety shoe in size 14? Sorry brogue runs to size 13. We do offer our Quentin models to size 14. Not quite as dressy but the fit is super comfortable and wide. Hope this helps. Hi Andrew. Since we are getting near the end of the year: Any update on this shoe being available in brown? Apologies for the late reply. This model is now available in select US retailers in brown leather. We still haven’t made a decision about the Canadian market. Please email us at feedback@mellowwalk.com with your shoe size. If we have an order going through the factory I can always add on a pair. Thanks. Really like the shoes but I am concerned about the single stitching. I would happily pay more for a robust Canadian made shoe. Many of our shoes have double stitching but because this is a dress shoe we opted for single stitching. It is a style we have made for many years (in Canada, of course). Thanks for writing.